Sláinte! May the saddest day of your future be better than the happiest day of your past. ...There will be no pinching of people not wearing green on my journal. How's the writing? I intend to come back with the updated tally, but that might be a bit; I just hit a scene break in Latest Bunny and it occurred to me I should get the check-in post up before I totally vanish into writing focus. I am actually wearing a green cardigan! I made half-hearted attempts with a few prompts - generator-created and otherwise - but only got a few sentences. Then I spent some time editing a first draft of a ficlet. It still needs some work, but at least I got started! Only 100 words so far. But today hasn't been good, so I'm glad to have written anything at all. We've been busy with a lovely concert and social life today, but I managed about 930 words of nonfic (blog post) before we left. Some story writing might still happen, though. Ugh...sidetracked by various chores, etc., but managed 877 words. I had hoped to finish the first draft today, but I think that's going to be a task for tomorrow and/or Tuesday. Persons who engage in pinching not green will be fed to the sarlacc without appeal. Also, more paragraphs today, remarkably. Maybe I need to switch projects for a bit, since I seem to be running into issues with actually getting the words out in paper in my usual flow. 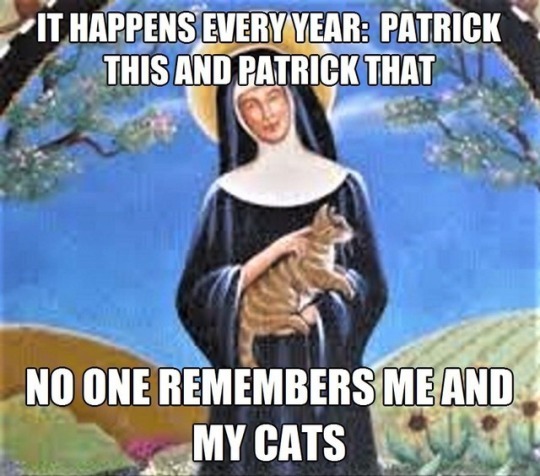 Also the feast day of St Gertrude, patron saint of cats. Just a few - 194. I'm plotting a new one. Edited and posted an old story. 450 words today. Not sure this draft will go anywhere, but at least it's a fun beginning.